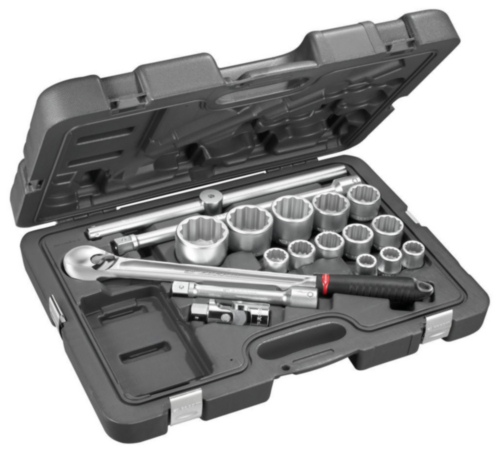 Includes: 1 x 3/4" ratchet - KL..161. 10 x 3/4" 12-point metric-size sockets - K.19H - 21 - 22 - 24 - 27 - 30 - 32 - 34 - 36 - 41 - 46 - 50 - 55 mm. 2 x 3/4" extensions K.210B: 200 mm. K.215B: 400 mm. 1 x sliding tee - K.120B. 1 x cardan K.240A. Supplied in plastic case. Weight: 14.893 kg.